by John R. Frazier, J.D., LL.M. In Florida, private-pay costs at nursing facilities can exceed $6,000 per month. Many families cannot afford to pay such excessive amounts — which can total more than $70,000 per year. 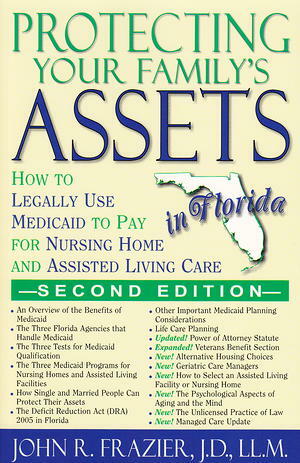 The Florida Medicaid program can offer a solution to the high cost of nursing home and assisted living care. But Medicaid has such strict asset-and-income limitations that most people believe it can be used by only the very poor. Fortunately, the U.S. Congress and Florida law provide opportunities to help families receive financial assistance through Medicaid and protect hard-earned assets. With proper planning, even those whose assets and income greatly exceed the limits for Medicaid can qualify for benefits. Florida Eldercare Attorney John R. Frazier describes multiple strategies that families can use to qualify for Medicaid assistance. Protecting Your Family’s Assets in Florida includes details covering the following topics, specific to both Florida and Eldercare: an overview of the benefits of Medicaid; the three Florida agencies that handle Medicaid; the three tests for Medicaid qualification; the three Medicaid programs for nursing homes and assisted living facilities; how single people can protect their assets; additional ways married individuals can protect their assets; the Deficit Reduction Act of 2005 (DRA) in Florida; other important Medicaid planning considerations, including an update on powers of attorney; an expanded Veterans Benefits section; life care planning; a new section on alternative housing choices, another way of protecting assets; a new section on the role of geriatric care managers and how to select them; a new section on how to select an assisted living facility (ALF); a new section on how to select a nursing home; a new section on psychological aspects of aging; a new section on the unlicensed practice of law in Florida, and a new Florida Medicaid managed care update.